How can I globally disable 'Text Replacement'? I've been looking for an answer to this question for a while, so I'm guessing this can only be solved with a console command. What I want to do is disable 'Text Replacement' everywhere on my Mac. The trick is, I have a library of text replacements that I use on my iPhone (like ill > I'll), and apparently it's synced to my iCloud account. 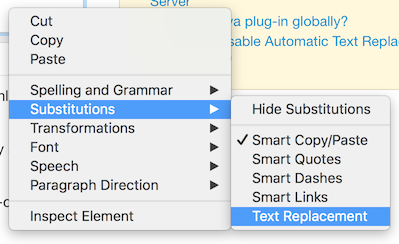 As a result, if I make changes in one place it affects all of my devices everywhere - making the easy solution of "delete all of the text substitutions from your substitution library" is unavailable. The text replacement I'm referring to specifically is the option you can disable by right-clicking on any text input area, then selecting 'Substitutions < Text Replacement' (see image). I know you can disable this one field at a time by right-clicking fields and unchecking 'Text Replacement', but it is enabled by default for every individual input on every field for every application (including the entire internet and my browser's search/address bar), and it periodically gets re-enabled on some inputs. And still I have to disable 'Text Replacement' on every field or it will try to correct my typing with entries in that dictionary. I use iCloud tabs, handoff, and a number of Apple's other "Better Together" features (and I don't want to lose the ability to track my devices with 'Find my [device]'), so I don't want to disassociate my iCloud account from my computer or devices, but I'd be really happy if I never had to disable 'Text Replacement' on an input field again. Any suggestions or ideas would be greatly appreciated! defaults write -g WebAutomaticTextReplacementEnabled -bool true from the first link (for enabling 'Text Replacement' in Safari). defaults delete -g NSUserDictionaryReplacementItems from the second link (for deleting the User Dictionary as seen in my second image). Both pertain to my issue tangentially, but each to the opposite effect I'm looking for. Will disable text replacement not just in Safari but in all other apps that use that input method (e.g. Evernote). Reboot is required (at least as of macOS 10.13.6), and the menubar checkmark UI won't visually change within each app. The change also only affects applications, and not Spotlight. As far as I know, there is still no good solution to this problem (as of late 2018 and 10.14.1). It was one of the first things I checked when I installed Mojave, and I was disappointed yet again. I believe the problem is that the text replacement setting is very granular, per-window/tab. There is no per-app or global switch that will be respected. (The defaults write command described above may help in some apps/contexts, but definitely not most.) Text replacement relentlessly defaults to ON in any new window/tab, with a few odd exceptions. In apps where all the action happens in one window (e.g. Messages), you can turn it off and largely forget it, but in apps where you're constantly generating new windows/tabs, text replacement is effectively unkillable — if you have them, you will trigger them. Not the answer you're looking for? Browse other questions tagged macos icloud system-prefs text text-input . Is it possible to enable OSX keyboard text substitution in more apps? How to reset Mac OS X text substitution? Select text-replacement without adding a space? Can I use iCloud with my devices on Windows XP? How can I stop my iPhone displaying “iCloud Backup requires that you verify your password” repeatedly? How can I import text substitutions from Wikipedia “Lists of common misspellings for machines”? Does iBooks sync metadata across devices via iCloud? How do I safely disable iCloud Drive and restore the documents back to my computer? Text replacement not working in Office?